I half expected the cookie dough to turn out a bit dry, maybe needing a spoonful of milk to bind it smoothly together (adding a touch of milk is what I typically do to my regular sugar cookie dough) but the dough was surprisingly soft and tender to the touch. The use of butter as well as oil, and confectioners' sugar, makes an interesting soft texture. It was a good indication of how the cookies would turn out and taste after baking. Make these cookies any size you want. Just take some of the dough and gently roll it into a ball. In my case, I took about 2 generous tablespoons of dough per cookie. Then, press the bottom of a glass with some sugar and use that to press down onto each cookie ball so that it's a little more than 1/4 inch thick. Instructions are clear to bake the cookies for no more than 8-9 minutes; the cookies will still be very soft. Let them cool and set a few minutes on the baking sheet before lifting to a cooling rack. The cookies don't spread very much during baking. A quick note on the cocoa powder used in this recipe. You can use either natural or the darker Dutch-process cocoa. Using what I had around the house, I actually mixed the two in the cookies and used Dutch-process in the frosting. In general, I wanted a deeper chocolate color to my cookies. I made half the recipe and got 17 cookies from my batch. While the cookies are cooling, whip up the chocolate frosting so you can get to the fun part of frosting them! ...or embellish them with sprinkles for the occasion you want to celebrate. As promised, these chocolate sugar cookies are soft and tender, full of sweetness and chocolate flavor. I stored extra cookies in the refrigerator and brought them to room temperature before eating. They stayed soft for the 2 days we spent enjoying them, and I think they would keep well for a couple more days on top of that. Enjoy February, and upcoming Valentine's Day! Make cookies: In a bowl, whisk together the flour, cocoa powder, baking soda, baking powder, cream of tartar, and salt. In the bowl of a stand mixer fitted with the paddle attachment, cream butter together with the granulated and powdered sugars until light and creamy, about 2-3 minutes. Add the oil and egg, mixing until combined. On low speed, add the dry ingredients and mix until dough comes together, scraping the sides and bottom of the bowl as needed. You should end up with a firm, soft dough that's not dry or overly wet either. Form dough balls (I used about 2 tablespoons of cookie dough each) and place on to baking sheets, a few inches apart. Place a couple of tablespoons of granulated sugar into a small bowl or dish. Dip a flat-bottomed glass into the sugar (rubbing the bottom of the glass with a little oil or butter will help the sugar adhere) then press the glass into the cookie, flattening it to about 1/4 inch or slightly thicker. Repeat with all dough balls. Bake for 8-9 minutes. Do not overbake; the cookies should still be very soft in the middle but set at the edges. Let cool on the baking sheet a few minutes before transferring cookies to a cooling rack. Make frosting: Cream butter with 1/2 cup of the powdered sugar with an electric mixer until light and fluffy, about 1-2 minutes. Add remaining powdered sugar, cocoa powder, heavy cream, and vanilla. Mix for 2-3 minutes, until frosting is thick and creamy. Spread frosting evenly on top of cookies with a small offset spatula. Decorate with sprinkles, if desired. Store cookies, covered in a airtight container, in the refrigerator for up to 3-4 days. How yummy and delicious these chocolate frosted cookies look, Monica. These would make an awesome Valentine treat. I could just imagine having a couple of these for breakfast with a hot cup of coffee. Delicious. These cookies would not last a day in our house!!! Wishing you a very safe and prosperous Chinese New Year Dear!!! I would goggle these delicious cookies up right away! They look fantastic! These are my kind of cookies Monica. So pretty with the frosting but they are probably terrific without too. Happy Chinese New Year! Thanks, Tricia. So many treats, so little time. I can't stop making treats even with all the chocolate and candies we have around! HI Monica, never heard of the Swig cookie before, they sound like something I would enjoy. 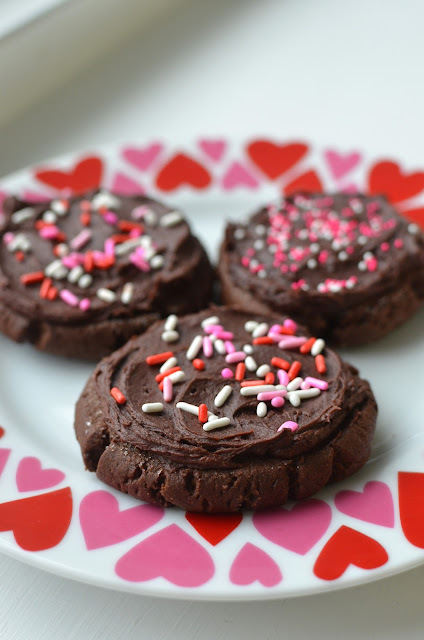 These cookies are perfect for Valentine's day, love how you decorated them. You know Monica, these cookies wouldn’t last one day in my house. Sweetheart (like your husband) is chocolate addict. Anyway, I ADORE your gesture "... pack a few of the cookie individually in small clear cellophane bags, sealed with a heart-shaped sticker." Actually, I tend to do the same thing for Xmas and Easter. So, while reading this post I had a large smile on my face. I love to have a peek into your life. Such a gorgeous lifestyle. And these cookies are yummy. And you are very sweet...thank you for reading and appreciating the little gesture. I wish we were neighbors because you are just the kid of person I'd love to bake for. Thank you! By simply looking at them I’m falling in love.The frosting looks so good over those amazing chocolate cookies. haha - I love that. Thank you, Bal! These cookies look and sound great! Soft, chewy cookies are my favorite, with or without sprinkles!Though I haven't heard of Swig either, I am not surprised that they are copied from cookies with a following in Utah. I am learning that there is a lot of amazing food in Utah and a lot of Utah foodies (and bloggers) to sing its praises! A little smear of frosting and a sprinkle of candy on top is about as good as I can get when it comes to decorating! I don't have your skills, Wendy. And isn't it wonderful how there's amazing food to be had everywhere now! Feb. is definitely the chocolate month. This soft cookies look so lovely with frosting and the sprinkles. Bring all all the pretty pink things for Valentine's Day, right, Kelly! ; ) Thanks and have a wonderful weekend...I hope you make a chocolate treat for your chocolate-loving hubby. What a delightful Valentine's Day treat! I can just imagine the texture they came out. They look great and you've made me hungry! Really soft and tender, plus plenty sweet and chocolaty. Cookies are happy food. It is funny but thinking back, I don't think I've had what I would call a soft cookie. Usually they are crisp or chewy. Your cookies sound intriguingly good. Monica, these soft chocolate cookies look awesome, and I love how you flat them with a cup...thanks for the tip. That was fun. It's always nice to try something of a different technique, even when it's just making cookies, to mix things up! Have a great upcoming weekend. Cookies + chocolate Frosting = Happiness all the way! Love these. Gorgeous! I hear you - what's better than cookies than cookies with chocolate frosting!